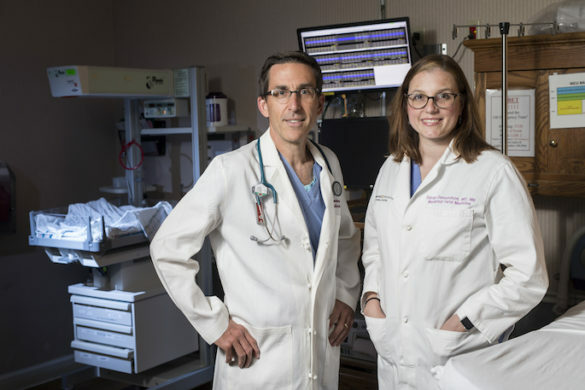 Most women who undergo a cesarean childbirth are prescribed more opioid (narcotic) pain medications than needed upon release from the hospital, a Vanderbilt University Medical Center (VUMC) study shows. The study, published online on June 8 in Obstetrics and Gynecology and in print in July, studied 179 cesarean patients from VUMC over an eight-week period to examine the variation in opioid prescribing and consumption after cesarean delivery, the most common major surgical procedure performed in the United States. “What we found is that prescribers, partly in order to expedite a patient’s release from the hospital, have kind of a one-size-fits-all prescription model for patients when they are discharged from the hospital,” said Sarah Osmundson, M.D., assistant professor of Obstetrics and Gynecology in the Division of Maternal-Fetal Medicine and the first author of the study, ‘Postdischarge Opioid Use After Cesarean Delivery.’ What we’ve learned is that this method may undertreat a few patients, but likely overtreats the vast majority of patients. The number of opioid overdose deaths in the United States has quadrupled in 15 years, a dramatic result of the current opioid abuse epidemic. The rise correlates with a sharp increase in the amount of legal prescription opioids dispensed. Most individuals using prescription opioids for non-medical purposes have obtained them from family members or friends who have been prescribed the medications. For the study, starting on postoperative day 14 until they had stopped taking the medication, women were asked weekly about the number of opioid pills used, the amount remaining and their pain experience. The state’s Substance Monitoring Program was used to ascertain prescription-filling details. The study authors also found that many patients with a 30-day prescription believe they are supposed to take the pills until they are all gone, when in fact, they only need to take them when absolutely needed. Normally over-the-counter pain relievers such as ibuprofen or Tylenol are sufficient in controlling post cesarean pain. The study found that most women (83 percent) used opioids after discharge for an average of eight days, and of the women who filled their prescriptions (92 percent) 74 percent had unused tablets. This amounted to about 2,540 unused 5 mg oxycodone tablets over the study period, Richardson said, and about 19,000 excess oxycodone per year from cesareans at VUMC alone. And the majority (63 percent) stored their pills in an unlocked location in their home, which is another cause for concern, Osmundson said. “Large studies show that the most common source for misused opioids are ones that are prescribed legally and to the appropriate person,” Osmundson said. “We know that these are falling into the wrong hands and that people frequently use opioids prescribed to a friend or family member. One way to tackle the opioid epidemic is not to have excess opioids around, which is unlikely to happen, or to minimize what we’re currently prescribing, which is doable,” she said. There’s a balance, though, Richardson added. “You don’t want to underprescribe either. In Tennessee a health care provider can’t just call in a refill for opioids, so if you underprescribe when the patient is sent home from the hospital, someone has to pick up a paper prescription, and that’s inconvenient for many patients. Osmundson and Richardson say that they plan further study to determine whether in-hospital opioid use can guide postdischarge prescribing to reduce opioids without undertreating pain. “If we can find a more nuanced way to prescribe, we can do a lot to reduce the excess opioids out there,” Osmundson said. Other authors participating in the study are: Leslie Schornack, M.D., Jennifer Grasch, Lisa Zuckerwise, M.D., and Jessica Young, M.D.